TV is full of cool characters. Few of them in the last decade, however, have topped those on Peaky Blinders. This half-real, half-fictionalised gang of miscreants and great haircuts have – thanks to the BBC – beamed their way into our lives. Silk Street Jazz have seen a raft of 1920s events spring up in the wake of this show. We’ve even performed at a Peaky Blinders themed party. Jazz is still very much in fashion. Yet the 20s were the heyday of Dixieland. Sure, America led the way for the genre, but no one could escape the shrieks of brass pouring from the UK’s social scenes. Real-life street gangs back then would’ve been as familiar with a trumpet solo as a razorblade. So that’s the energy we were hired to bring for our client in Leeds, who is a huge Peaky fan. They were transforming a restaurant in The Light (a retail and leisure centre) to resemble one of the smoky gatherings in Steven Knight’s TV universe. We arrived early. As the band tuned up, we saw a vintage ticket booth erected for people on the guest list. Sure enough, dozens of invitees were strolling up in tweed, shirts, high trousers, headdresses and glitzy flapper outfits, and moved straight to the Peaky Blinders themed party bar staff, who were also in on the aesthetic. This was going to be quite something. The beers, whiskeys and rums were in full flow when our band started up. Prior to that, guests had already been mingling with actors in the venue, each of whom represented a character from the show’s first four seasons. There was plenty of dancing and impressions. And, between the chaos, we saw tarot readings carried out to the delight of many guests. Silk Street Jazz accompanied the centrepiece of the evening: an old-school projector, with vintage horse races displayed on the wall of the eatery. Everyone betted fake ‘fun money’ on their pick. There were losers, of course, but we raised their energy back up, playing a set after each race. A Peaky Blinders themed party would be nothing without a great soundtrack. The actual show, as you’ll know, uses tracks from Radiohead, Nick Cave and PJ Harvey – but we were asked to keep it winningly authentic to the vintage music of the age. That meant we stuck to the expertise of the banjo, clarinet and bass sax. As you might’ve guessed, our Leeds gig was a storming success! 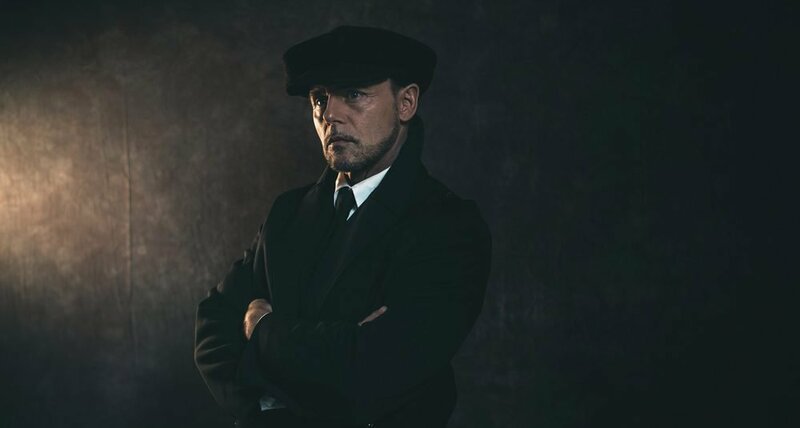 You can book Silk Street Jazz, in any of our guises, for a Peaky Blinders themed party on your own calendar. Watch the event as it unfolded above – filmed by Grit Pictures – to see how yours might turn out, with plenty of Shelby swagger on the dancefloor.